Okay, I lied. I wasn't planning on posting again until we get back Sunday night. Nor was I planning to do a Halloween post. 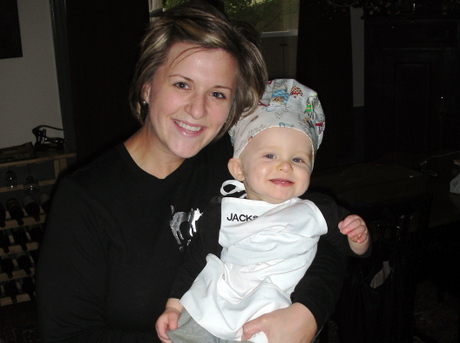 But, when your kid looks as cute as ours does, particularly in his little chef's costume, how can I resist? I probably won't be blogging much over the next few days. 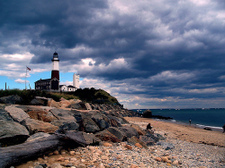 As I mentioned last week, we're heading to Montauk tomorrow to celebrate Nena's 30th birthday. We're kind of playing our four days there by ear, but we are definitely planning to have dinner one night at Inlet Seafood, which was recommended by several of you. It's possible that I'll be able to snag a wifi signal from a nearby resort (the house we're renting doesn't have it) so you may get some as-they-happen updates. If not, I'll post about all the fun (and wine I'm taking) later. 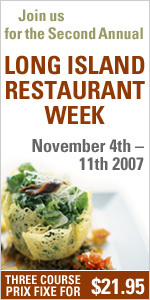 In the meantime, for all you Long Islanders out there, check out Long Island Restaurant Week, which starts on Sunday. 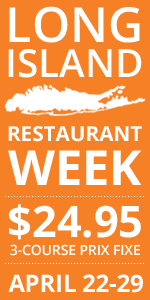 Three courses for $21.95 at many of the Island's best restaurants. If we can find a sitter, we certainly plan to take full advantage. 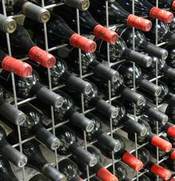 I was talking with a LENNDEVOURS reader yesterday about his wine storage situation. As he described his motley crew of different racks, refrigerators etc., I had an idea. Wouldn't it be cool to get a look at your favorite blogger's rack? WINE rack that is. Be it a case shipping box in the back of the closet, a professionally designed and install super-cellar, or a humble IKEA wine rack on the kitchen counter, I'm a little fascinated by wine storage and would love to see what people are doing. So next Friday, November 9th, post a picture of how you store your wine. Maybe we should set up a Flickr group for this. What do you think? Yesterday afternoon, several members of the LENNDEVOURS community winemaking project descended up on Sannino's Bella Vita Vineyard to press the juice from the grapes we harvest a couple weeks ago. I was upstate, so couldn't attend, but one member took several photos and posted them. I've heard through the grape vine (awful pun, no?) that there are several different types of oak barrel in play as well as a couple different yeast strains. We're going to have a lot of options (and fun) when it comes time to blend our wine I think. I just heard this morning that the vineyards and buildings once associated with Rivendell Winery are for sale and on the market. The winery itself is moving to a new location. For $1.6 million, you can get 45 acres, a 3,000 square foot pavilion (currently the tasting room) and three single-family residences and several outbuildings on the property. The property, located in Gardiner, NY on the Shawangunk Wine Trail in the Hudson Valley region, is a little off the beaten path, but the tasting room/building is absolutely beautiful. Nena and I were there a few years ago and really saw a lot of potential. The grounds weren't as manicured as we're used to here on Long Island, but again, the potential is there. Anyone want to loan me $1.599 milion? 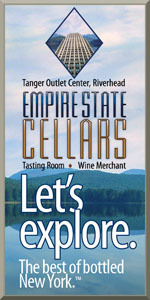 There is not a winery proper on the grounds (I don't think), and many of RIvendell's best wines are made with fruit from Long Island and the Finger Lakes, but compared to Long Island vineyard/winery prices, this is a bargain in a location easily accessible for Manhattanites. A virtual tour is available online. The current owners are the same people who own the two Vintage New York shops in Manhattan. 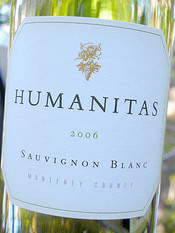 Humanitas Wines: Good Wine. Good Price. Even Better Cause. News Flash: I've found some California wines I can enjoy, afford for every day drinking, and feel good about. Humanitas Wines, founded in 2001 by Judd Wallenbrock, is a California winery unlike any you've heard of before. Seriously. Many wineries are involved in philanthropic endeavors. They host fundraising events or give a portion of wine sales proceeds to various causes, but Wallenbrock takes that to a whole other level. All of his profits go to charity. Every cent. Specifically, the profits are donated to address three primary issues – hunger, affordable housing, and illiteracy. A two decade veteran of the California wine business, including stints at prestigious Robert Mondavi and De Loach wineries, and his current gig at Michel-Schlumberger Wine Estate, Wallenbrock founded Humanitas because, his "passion is in the enjoyment of wine, my expertise is in building strong wine brands, and my heart is in philanthropy." But these wines aren't run-of-the-mill plonk. He describes his desired style as 'over-deliverance' meaning that his wines deliver quality beyond their price points. Wallenbrock told me earlier this week that he wants people to say, “Wow, that is a wonderful wine. So approachable, yet pretty darned complex. Oh my gosh, it only costs that much? Fantastic, and, oh my gosh number two — the profits go to charity? Sign me up!" He strives for a style where "one sip invites another" where the whites are about fruit, not oak, and a cabernet sauvignon that offers "a great nose up front, full middle body, and soft, sweet tannins on the finish." Best of all, these wines are affordable because he sources the grapes for his wines in the Central Coast and he doesn't have his money invested in a big estate and a big winery. Of his operation, he says, "I have zero overhead because I functionally 'rent' space to make my wine in other people's wineries…and I focus on nothing but the wines and the charitable contributions." Humanitas' latest releases—two whites and that cabernet—are all priced under $20 and avoid the overmanipulation found in many California wines at their price points. Wallenbrock made 490 cases of his Humanitas 2006 'Oak Free' Monterey Chardonnay ($16), it is a fine example of why I love unoaked chardonnay so much. The nose offers lemon, apple, and a faint hint of pineapple. On the palate, it is medium bodied and shows loads of apple flavor with just the most subtle tropical notes. There is just enough acidity to bring balance. All in all, this is a nice wine, and this definitely isn't your typical flabby, over-oaked Cali chardonnay. Many of Long Island's most exciting whites are made with Sauvignon Blanc, but I've long found many California bottlings less tasty. 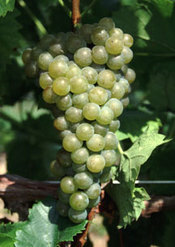 It seems like some West Coast winemakers like to treat Sauv Blanc as if it is chardonnay. But again, Wallenbrock eschewed all oak in making his Humanitas 2006 Monterey Sauvignon Blanc ($14) which is fresh and delicious. It's fairly simple, but the clean, pure grapefruit and mandarin orange flavors are well balanced by acidity in a medium-bodied package. At $14 — and with screw cap closures — this is a terrific house white. Fewer than 300 cases were produced. The Humanitas 2005 Paso Robles Cabernet Sauvignon ($18) is a fruity (no surprise) cab with well integrated tannins. The aromas and flavors are all about blueberries and subtle brown spice — almost reminiscent of blueberry pie. He's hit the style he's going for on the head here. And while this is more a cocktail wine than anything else, it's better than many California cabs I've had for twice the price. When I asked Wallenbrock what his short-term plans are for Humanitas, he said that, "Humanitas will have a sub-$20 tier always — to allow people to 'drink charitably' just about every day." But he is also planning to release some small lot, vineyard designated wine within the year. "I have about 80 cases of a 2005 Napa Cab from the Caldwell Vineyard about to be bottled — in the Vino-Seal closure, the glass bung-like closure — that will be released in the Spring. I also have a little Pinot Noir, Cab Franc, and Malbec — all in tiny quantities coming out next year. Really fun stuff." Between his full-time "day job" and running Humanitas, I had to ask him how he keeps going, how he finds the energy to do it all. "What keeps me going is knowing that I'm doing something really good for the world. I have a vision that wine can and will change the world, and I'm leading the charge. I really like the artistic side of the wines I make — it balances my life a bit. And, I believe that someday Humanitas will be discovered by someone I can truly partner with to take it to the next level — one where it can grow to the level where it really makes a difference, both financially for charities and emotionally for how people make their purchase decisions. There are literally tens of thousands of wine choices out there – Humanitas actually has clear point of differentiation and a compelling 'reason to believe'. This is what revs my engine." 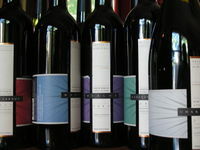 To order these good wines and good prices for even better causes, visit www.humanitaswines.com. You can even choose which of Wallenbrock's chosen charities your purchase goes to. Next Friday, Nena turns 30. To celebrate, I've rented a house out on the eastern-most tip of Long Island in the town of Montauk for a few nights next week and weekend. I've only been to Montauk a few times and never for more than a few hours, so I'm looking for some suggestions for restaurants and things to do beyond enjoy the Atlantic. Any suggestions? Keep in mind that we'll have the little one with us, so "family friendly" is an important descriptor. On Sunday, Nena and I took Jackson pumpkin picking for the first time. Yes, I know. The same guy who complains about the road-clogging, pumpkin-picking families every year joined the fray with his own kid. So sue me. You do crazy things for your kids. Even if they can't walk yet and can't actually pick anything. But we definitely did it our own way, first meeting up with some good friends at Roanoke Vineyards for a glass of wine beforehand. Our kids (both under a year old) played as we enjoyed the early afternoon and some wine. Next, we headed over to Rottkamp's Fox Hollow Farm to meet up with two other couples (and their kids) to pick pumpkins. You guys don't really want to read about the pumpkin picking though, do you? I didn't think so. There's nothing much to report anyway. So what were Nean and I to do after picking pumpkins with three other couples and a total of four children, ages nine months to three years? A nap would have been more than welcome, but as we drove west, we decided to stop in at Baiting Hollow Farm Vineyard and their recently opened tasting room. The parking lot was packed — tis the season after all — and live music greeted us from a gazebo on the back lawn. Children milled about, in their Jets and Giants jerseys (Nena wouldn't let me put Jackson's Steelers one on him) as their parents sipped wine and relaxed out on an expansive back porch. Not wanting to fight upstream with our stroller, we walked around to the front and went in the main entrance and were impressed with the space. I’ve driven past the building for months while it was being renovated and the time — and no doubt money — that went into the work in clearly on display. The entire building is beautiful, lots of dark wood, a copper-top bar. In some ways, it reminded me of some wineries we’ve visited in Sonoma. It certainly stands out on bucolic Route 48. After weaving our way around some poorly placed tables and another crowd inside, we asked to do a couple tasting flights, but we didn’t get them. You see, BHFV doesn’t actually offer flights. it’s a per-taste set-up that seemed to make more work than necessary for both customers and pourers alike. It's just one man's opinion, but flights would definitely streamline things and make the experience better for everyone. That said, even up against an onslaught of anxious tasters, the staff did their jobs pretty well. They were a little overwhelmed, but it barely showed. Best of all, the wines were served at the proper temperatures — the whites weren’t ice cold, which they often are — and our glasses were replaced for every taste. A new glass for every wine may be overkill, but it's hard to complain about that. And once Kim, our pourer, noticed that we were spitting — rather than swallowing our tastes — and knew a bit about wine, she started to open up and share more information about the wines too. Most in the room clearly didn’t care much about growing years or how the wines were made, but, it's that time of year. The wines, as one might expect at a winery making its debut, were a bit up and down, but there were wines worth going back for. The two white wines on the list were a bit underwhelming. The Baiting Hollow Farm Vineyard 2005 Chardonnay ($17), fermented and aged entirely in stainless steel offered fresh, clean and citrusy flavors with hints of crisp apple, but would be a much better value at $12 or $13. The 2005 Riesling ($17) made in an off-dry style, was similarly serviceable, with ripe peach and melon flavors, but there wasn’t quite enough acidity to balance the residual sugar. If you like off-dry rose, you will probably like their 2005 Rose ($16), which overflows with ripe wild strawberries both on the nose and on the palate — and has delicious, refreshing acidity. It’s just a little sweeter than I prefer. 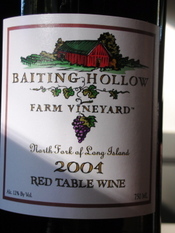 By far the best value in the portfolio, Baiting Hollow Farm Vineyards 2004 Red Table Wine ($13) is a blend of 70% Cabernet Franc, 25% Merlot and 5% Cabernet Sauvignon that is fairly light bodied with red berry and spice flavors. It’s a nice everyday wine that — true to its name — is probably best at the table with food. Of the two merlots on offer (both $19), the 2003 is cherry-dominated and a little smoky, but light and a little watery on flavor. Instead, try the 2004 which offers blackberry and black cherry flavors accented by a little vanilla and oak. It’s a nice red that hints at the potential of future vintages. The best wine, by far, however is Baiting Hollow Farm Vineyard’s 2004 Cabernet Franc ($20) offers terrific blackberry, spice and earth flavors. Medium bodied, the tannins are smooth and the finish lingers. I can't recommend the cabernet sauvignon, which was underripe and green tasting. I read an interesting little piece this morning from the Cornell Daily Sun that talks about hybrid grape varieties, their advantages and what some wineries in the Finger Lakes are doing with them. Apparently, in addition to being more resistant to the cold weather of the region, they are also less susceptible to the typical grape maladies, meaning that fewer pesticides are needed to grow them. It's kind of an interesting way to "go green" no? I know that there are plenty of wine lovers out there who turn their noses up at hybrids, but I've found several seyval blancs that were tasty, if simple, and vidal (or vidal blanc depending on who you talk to) leads to some delicious table and dessert wines. 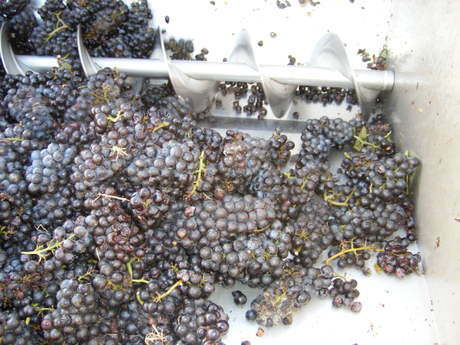 Dave Peterson, general manager at Swedish Hill Vineyard, is quoted in the story as saying that Traminette, another hybrid, is "virtually indistinguishable from the European grape that was one of its parent varieties." I've had at least 5 or 6 different Traminettes, all from the Finger Lakes, and while it's certainly easy to identify Gewürztraminer as a relative, to call them indistinguishable is ridiculous. The ones that I've had have been very one dimensional. I guess if we're comparing them to cheap, uninteresting Gewürztraminer, they might be very similar, but not if we're talking about top-flight gewurz. What kind of experiences have you had with these and other hybrids? Just in case you missed it, I'm the subject of Tom Wark's latest Bloggerview over at Fermentation. Take a look and find out a little bit about me that you probably don't already know. And, for those of you that have arrived at LENNDEVOURS for the first time because of the interview, welcome. Take a look around and I hope you enjoy yourself. This past Saturday morning I got up early and headed out to the North Fork to pick up some local veggies for the coming week. The beets, carrots, Japanese eggplant and heirloom tomatoes are from Sang Lee Farms. The cheese pumpkin (I actually bought two) are from Harbes Family Farm. 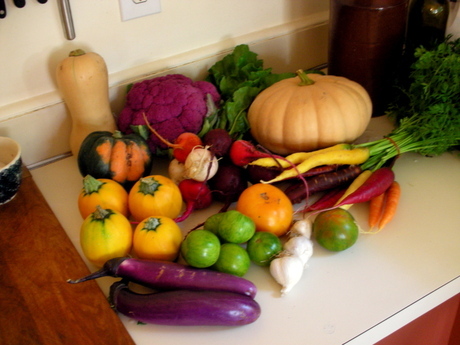 The acorn squash, butternut squash, round summer squash and purple cauliflower are from Northville Farm Stand. And, the three different varieties of organic garlic are from Garden of Eve. So far, I've roasted both pumpkins...one for Jackson and one for his parents, and we've eaten most of the tomatoes. "How old is that apple tree?" I asked Uncle Sam, pointing at the gnarled, sprawling specimen that towered over his small orchard. "Well, it's been there a long time. My father probably planted it before I was born," replied the 82-year-old. I was helping Uncle Sam pick apples at his farm, aided by one of my wife's older cousins and his three-year-old son. I climbed up the trees to reach the highest branches upon which no ladder could lean and shook vigorously, dropping the ripe gems to the ground. The little guy giggled and ran about, picking up as many of the pie-bound Northern Spy apples as he could. These Northern Spy apples, coming from very old trees, were really tasty. Most public orchards don't provide an opportunity to pick apples from such an old tree. New York State is home to a wide variety of apples and apple-growing regions, ranging from Long Island to Lake Erie. The Finger Lakes region is no exception. Orchards of all shapes and sizes can be found in many locations between and around the lakes. The valleys west of Syracuse are home to a great deal of apple orchards, and on the plains north of the Finger Lakes, just south of Lake Ontario, can be found some of the largest commercial orchards in the state. In addition to the picking done at the family farm, my wife Kathleen and I recently went to one of the Syracuse area's best public orchards, Beak & Skiff. 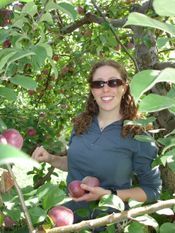 This orchard is a Central New York institution and a fun fall trip for families. After we picked some fruit (Kathleen is pictured at right) we went into the orchard store where I was happy to discover that Beak & Skiff had recently renovated its apple winery tasting room down the road. Of course, I immediately headed downhill to see what was going on. I am not a huge fan of fruit wines since most tend to be a little too sweet. Beak & Skiff's wine and cider selection, however, impressed me. The wines are made from different apple varieties and range from reasonably dry to sufficiently sweet. The ciders are crafted in a traditional manner with relatively low alcohol and a crisp, acidic taste. Apple wine will never exhibit the complexity of grape wine, but apples are a far more accessible fruit to which we can all relate. Most of us (with some notable exceptions) never get a chance to handle wine-bound grapes in the vineyard. Apples are different. We eat them constantly, and nearly all of us can find a local orchard in which to experience the fall harvest. Getting out there and picking the bounty of the land is always an invigorating experience. 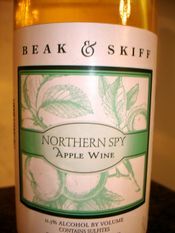 Apples are fun to pick, go great in pies, and, thanks to places like Beak & Skiff, even better to drink. I recommend giving their wine or cider a try. I was told by the staff that Beak & Skiff will soon be offering vodka made from apples. I imagine I'll be duty-bound to return next year and see what apple vodka is all about. We all know, green/sustainable/biodynamic/organic vineyard management is one of the hottest topics in the wine world these days. But how can the uninitiated get on the road to greenness? Cornell University and the Cornell Cooperative Extension have just released a new workbook to help grape growers in New York and the Northeast. 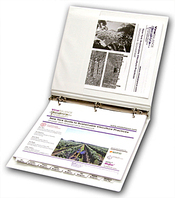 The 125-page self-teaching workbook, "New York Guide to Sustainable Viticulture Practices," offers guidance in evaluating and adopting the best management practices for minimizing environmental impacts, reducing economic risks and protecting worker health and safety. Topics include: soil management to reduce erosion, runoff and leaching; use of integrated pest management practices for insect, disease and weed management; nutrient management, with a particular focus on nitrogen use; pesticide management and spray technology; and cultural practices used in viticulture. It is available in both print ($30) and a free online versions. A little over a year ago, Miguel Martin joined Palmer Vineyards as its new winemaker bringing nearly 20 years of experience at wineries like Gonzalez Byass, Robert Mondavi, Yalumba and Catera. Obviously his coming to Long Island just in time for harvest means we won't truly taste his impact until the 2007 vintage is released. Those will be the first wines that he nurtured in the fields as well as crafted in the cellar. Still the 2006 was his first crush on Long Island and wines from that vintage are technically his first here as well. 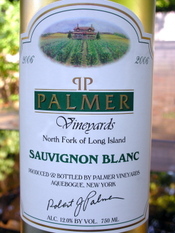 This Palmer Vineyards 2006 Sauvignon Blanc ($17) is a nice start to Martin's reign at Palmer, even if the price has gone up 30% since the 2004 release. A pale yellow with a faint greenish tint, this wine offers citrusy, lightly herbal aromas with a distinct lemongrass note. The palate is ripe and citrus-driven with fresh acidity, a little more of that lemongrass, understated hints of herbs and a chaulky, minerally finish. Because of that lemongrass note, I think this wine would be great with Thai-style mussels. I tell anyone who will listen that they should try new wines whenever possible. That’s how we learn about new regions, grapes and winemakers. It’s how we expand our wine knowledge and grow as wine drinkers. But, that doesn’t mean that we can’t — and shouldn’t — come back to long-time favorites as well. Pellegrini Vineyards — and its Vinter’s Pride Encore — are just the kind of favorites worth coming back to. It was one of the first red blends I tasted on Long Island and remains one that I enjoy every time I taste it, regardless of vintage. 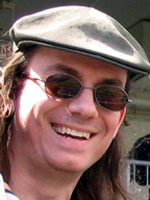 Pellegrini’s winemaker, Russel Hearn, was born in Australia. He started his winemaking career at the age of 16 and brought his skills and experience to the North Fork in 1991 when Pellegrini Vineyards first opened. He combines traditional methods and sensibilities with some of the most advanced equipment on the East Coast to consistently craft quality wines at reasonable prices in this sometimes-pricey market. Several of Hearn’s new and upcoming releases seem extremely well suited to the harvest dinner table — and for the upcoming holidays as well. Though it’s been released for some time, the latest vintage of my long-time favorite — the 2001 Vinter’s Pride Encore ($40) — delivers. 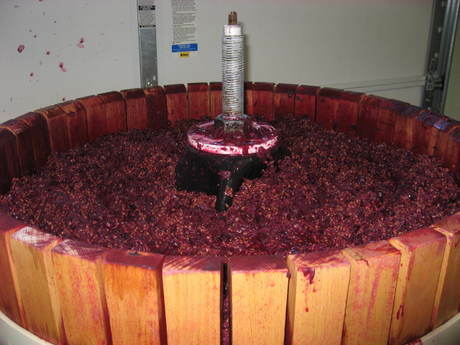 It is characterized by fresh crushed and preserved blackberries joined by light smoky oak, spice and minerals. This wines spreads widely over the palate with ripe, smooth tannins and a minty finish. Though mature and tasting beautifully now, this wine has plenty of time left. It should improve for several more years. It’s a wine that I’ll keep coming back to, no matter how much vinological exploring I do. (3.5 out of 5 | Very good-to-Delicious). The title says it all...I just really liked this one. Am I a Professional Wine Writer? "Where did you go to journalism school? And what are your credentials as a 'wine critic'?" That interesting little excerpt comes from and email I received a couple weeks week from the well-respected and well-regarded president of a New York wine organization. Someone who has done a great many great thing for New York wine over the years. This was in an email telling me, more or less, that he didn't want to answer the questions I asked him. It is his right, of course, to refuse my interview questions. He doesn't have to speak to or email with me. But for him to attack my right to ask them, which is essentially what he's done, just shows that he is woefully behind the times and, frankly, ignorant to the way wine media works these days. To be fair, he started in his current post while I was still in grade school. He is obviously most comfortable with traditional media and I'm sure that he's not alone. I'm sure that he's not alone, particularly in the New York wine world. I make no claims to any formal wine education. I learn by popping corks (or cracking Stelvin closures), tasting, pondering, and tasting some more. I talk to winemakers. I talk to fellow wine lovers. I am a (I hope) respected member of a tremendous online wine-writing community. Do I need to have a Masters of Wine or several dozen wine judging gigs under my belt to write about wine and know what I'm talking about? Clearly, the publications that I write for outside of LENNDEVOURS don't think so. No, I'm not writing for Parker or Shanken, but I have made a few extra bucks writing about wine for "real" newspapers and magazines too. I've written over 1,300 posts here on LENNDEVOURS, the vast majority about wine. I taste, I'd guess, at least 99% of the wine made on Long Island every year. I have an ever-growing and passionate group of readers. I get invited to events, shipped wine samples and sent press releases based solely upon this blog. Most don't even know that I write for "old media" too. Perhaps the strangest thing about the email exchange that sparked this post is this ... why would this guy react this way to me in the first place? Yes, I've questioned some of the things his organization has done over the years, but I've never attacked him personally. Maybe it's because the New York wine industry is used to getting good press or no press at all (more on this another time, maybe). You'd think that I'd be seen by people in the New York wine industry as a positive. I write about them and their wines more than anyone else. Actually, most people in the wine industry do see me as a good thing. It's just a handful people who have been in power for a long time who don't like when anyone questions their ideas or practices. Guess what? You're not perfect. You're not above question. And in some ways, you're falling behind in a region that is moving forward...with or without you. This isn't the only post sparked by my experience with this guy. Ryan over at Catavino did a post about this topic. As did Tom over at Fermentation too. I'm a little behind with this, but the roundup for Wine Blogging Wednesday #38, Portuguese Table Wines has been posted over at Catavino. As you can see, we had a nice turnout and the wine lovers behind Catavino did something a little different with the roundup. Certainly as participation grows, it becomes more and more tedious to read the roundup posts (let alone write them). Let us know what you think about the format they tried. I'm also happy to announce that one of my favorite semi-local bloggers, Brookynguy is taking over the hosting reins for November's WBW #39 with Silver Burgundy as the theme. Like I told him the other day via email, my knowledge of Burgundy is only sizable when compared to my knowledge of nuclear physics, so this should prove to be an educational month to be sure. As always, you can head on over to the still-new Wine Blogging Wednesday site for all the news and updates. And, if you have any feedback or suggestions on how to make the site better, just shoot me an email. 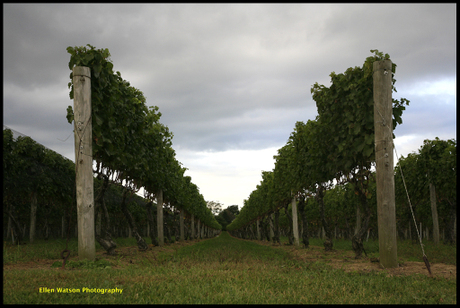 Our latest vineyard view from Wolffer Estate Vineyards (taken by Ellen Watson) shows how much of a difference just a few weeks can make. The dandelions are gone. The bird netting is gone. And so are the grapes. I'll be posting some harvest shots Ellen took soon. In the meantime, check out the Flickr slideshow. October's shipment from the New York Cork Club will be sent out soon, and it's time to let members know what's coming (and let non-members know what they are missing). 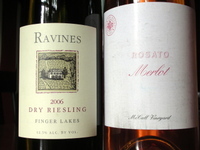 First, as you can see, is the Ravines Wine Cellars 2006 Dry Riesling ($16). Yes, I know I'm sending another riesling and I swear I wasn't planning to, but this one is just too tasty. Filled with lime, mineral and faintlyl floral qualities and awesome acidity, this really shows off everything that is so great about Finger Lakes riesling. And at $16 it's a great buy too. Our second selection this month, Channing Daughters Winery's 2006 Rosati di Merlot ($17), is another one that I hadn't planned on. I tasted it a while back and enjoyed it, but it wasn't until I had it at two great local restaurants, with food, that it hooked me. The somewhat standard strawberry and watermelon flavors are here, but it's the intriguing earthy quality that jumps out at you. I had it with fresh pasta tossed with sage and pistachios and it was as perfect as perfect gets. This wine is sold out, but we were able to get enough for the club. And, this is the last year it will be made with merlot from the McCall Vineyard in Cutchogue, so I'm glad we got it. Serve them both at Thanksgiving if you want, they'll be perfect with the variety one usually finds on the Thanksgiving table. That's it for this month, but I'm hot on the trail of some great, hard-to-get and just-plain-stellar wines for next month. In our house, there's only one baker. And it's not me. Baking just requires a level of precision and adherence to ratios and recipes that I'm simply not capable of. I always put a little extra of this or that in when I'm cooking. Do that when you're baking, and you could end up with a horrific result. Nena, on the other hand, is quite a baker. It's one of the things that I fell in love with early in our relationship. Between my cooking (and hers as well) and her baking, we are a complete culinary set. She completes me. Cliche? Yes. But true. And, after our trip to the Hudson Valley Saturday, we had a lot of apples laying around. Above, you can see the delicious result of her work. I think this was her best crust yet. 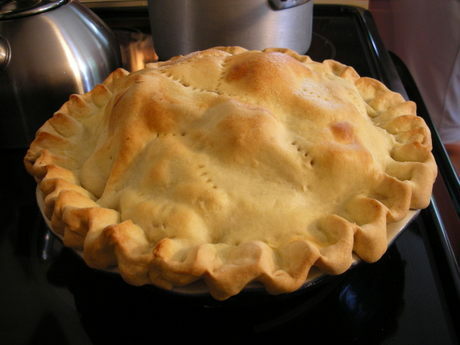 I say "was" because the pie is gone already, shared with friends and in my belly. 2003 wasn't a great year for North Fork reds. I've written about it before, but basically there was a rainy period in October (after a good growing season) and two rounds of frost that resulted to many sub-par wines from that year. Particularly reds. 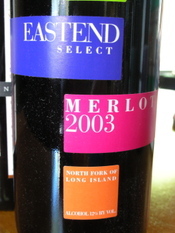 And Pellegrini Vineyards' 2003 EastEnd Select Merlot ($15), which is normally a decent, gulpable seems to have fallen victim to that bad weather. The nose is promising enough, offering straightforward black cherry aromas with a little earthiness and smoke. But the palate is disappointing and disjointed. Fairly light in body, there's some cherries, dried leaves and even a little black pepper, but it's watery and thin, with harsh, tart acidity on the finish. Luckily, the other new and upcoming releases from Pellegrini Vineyards were much much better. You'll read about those this week. Roman Roth shared some exciting news (at least for riesling lovers) with me over the weekend. He's making a Grapes of Roth 2007 Riesling. Roman found 4 tons of fruit at Split Rock Vineyard in Greenport, and as he put it "The grapes looked great when I first saw them with a low yield of 2 tons per acre and so I jumped at the opportunity. We have been babying it here at the winery. At the moment it is fermenting at extremely low temperature of 56 Fahrenheit and it is looking good." Just like the GoR merlots, only about 200 cases will be made, and they should be released next spring sometime.